I hardly ever post pictures of myself on here, so you probably don't know that I have a beard. It's not quite "Jimmy Akin" long, but it's getting there. It recently grew past my collar bone, a sort of milestone in the beard-growing community. It's red, even though the hair on my head is dark brown. I'm not a geneticist, I don't know how in the world these things happen, but they do. I introduced myself, shook his hand, and gave him my contact information. It was all a very pleasant surprise, and I walked away thinking, "All of that started because he liked my beard. My beard just evangelized!" It made me glad to have something that can be a conversation starter, that gets people to open up and share a bit of themselves. I'm just gonna keep rockin' this beard. 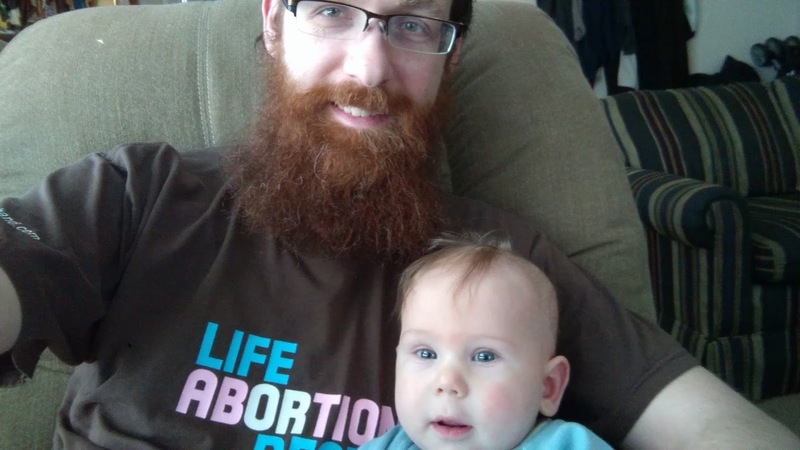 My son Thomas, resting under the bearded mantle of his father. Does Anyone Really Enjoy Valentine's Day? What Is the Meaning of Consecration? 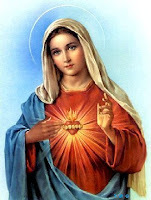 The "Mother of All Peoples" website has more articles on the Immaculate Heart of Mary than I could possibly list here without losing a week of my life, so I suggest browsing that website for more information on this topic. I'm not sure how popular he is (I've never heard of him before), but there's a guy on YouTube named Mike Winger who has a 4-part video series with which he attempts to refute the teachings of the Catholic Church. I don't even remember now how I found the guy, but somehow I ended up on Part 4 and started watching it (I haven't seen the other parts yet). He does seem to have some familiarity with Catholicism, almost like someone who used to be Catholic but then fell away. But, he also misrepresents the teaching of the Church a great deal. People were pointing this out in the comments, but no one was giving any actual examples so I thought I would provide that worthwhile service. Note that I am not even bothering to respond to his theological errors or his misinterpretations of Scripture (maybe that's a post for another day). I am simply pointing out the times when he misrepresented what the Church teaches or why She does what She does. But, I think that even this exercise can be instructive for people. I hope you find it helpful. 1:25 - Yes, a sacrament is a means of grace. Your mistake was when you put it in your own words. We do not believe that the sacraments are "a way that you can earn grace." You will not find that anywhere in the Catechism. The only one working in the sacraments is God. 2:12 - It was not "certain forms of indulgences" that were frowned upon, but instead the abuse of a legitimate practice. 2:40 - While indulgences are a part of the spiritual life of the Catholic, and they are not something that a Catholic could say were false, I would not go so far as to say that they are "essential to Catholicism." I think you're giving indulgences more prominence then they deserve. 3:58 - Our reason for believing that the sacraments are necessary is not because "there isn't enough with just Jesus." We have the sacraments and find them necessary because the grace of Jesus -- which is MORE than enough -- is given to us through them. 4:08 - Yes, Catholics have to baptize their children into the Catholic Church. But, you seemed to imply that Catholics don't recognize the baptisms of other Christian denominations, which would not be true. Any person baptized with the Trinitarian formula is validly baptized. 4:30 - Catholics believe that baptism washes away ALL sin, not just original sin. When baptized as an infant, baptism only washes away original sin because infants haven't committed their own sins yet. But, adults who receive baptism have ALL of their sins washed away. 5:09 - Catholics do not believe that being born again amounts to a mere declaration. Baptism makes us a new creation, we are regenerated by it, an indelible mark is placed on our soul so that we are forever changed. An infusion of grace takes place in baptism. By it we put away the old man and put on Christ. It is in every way more than a mere declaration of a new status. 7:29 - The "whole doctrine" on infant baptism is not built on the phrase from Acts that "his whole household" was baptized. It stands on much more evidence, and stronger evidence, than that ... although I will admit that this verse is a piece. 10:03 - The fact that the only minister of the sacrament of Confession is a priest does not mean that we can't go to Christ to have our sins forgiven. We can pray to Jesus with a contrite heart and He will forgive our venial sins. Only mortal sins are reserved to the sacrament. And at any rate, when we go to Confession we believe that we ARE going to Christ because it is Christ who forgives through the person of the priest. 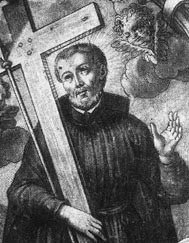 10:47 - The treasury of the Church contains not just the good works of the canonized saints, but of all the saints in heaven and those on earth as well. 10:59 - They are not ONLY received through the keys, but I will say that the ministry of the Church is the primary or normative means. 11:47 - We don't follow the instructions of the priest (or, to put it another way, we do not perform our penance) in order to stay out of Purgatory. That is a result, but it is not the primary motive, which is to heal the negative effects that our sin has upon our neighbor and the Body of Christ. 12:25 - The stole is only purple in the administration of the sacrament, and then more because purple is representative of penance than because it is an expression of the authority of his office. In the administration of the other sacraments, the stole is the color of the liturgical season. The stole does represent the office of the priest, but it also represents the yoke of Christ, since it is worn over the shoulders of the priest. 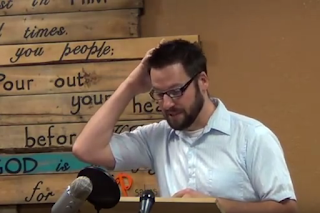 16:27 - We do not believe that the purpose of the Mass is to "appease the wrath of God." That is nowhere present in the Catechism. The purpose of the Mass, specifically the sacrifice of the Mass, is to make Christ's work of redemption present to us and to apply its benefits. 18:33 - Mass is celebrated daily not because "grace is handed out piecemeal" but because Christ instructed his disciples to pray for their "daily bread", because it was the practice of the apostolic church to meet daily for the "breaking of the bread" (Acts 2:42, 46), because worship is not something that you just offer God on Sunday, and for many more reasons besides. 24:57 - You said it was "considered, at least for a long time, a mortal sin" to miss Mass, but that has never changed. It is still considered a mortal sin to miss Mass on Sunday. It flows from the requirement of the Third Commandment to keep the Lord's Day holy. But, a Catholic is not required to go to Mass on the other days of the week. 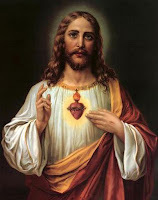 27:46 - The reason that the sacrifice of Christ is re-presented in the Mass every day is not because, as you put it, Jesus only paid for the sins one committed since the last time he went to Mass. Jesus paid the price once, we know that. But, the grace has to be applied to us. This happens every day in the Mass because sinners are always in need of the grace of God. 28:00 - The Church does not teach that we need this grace because we are constantly condemned. If you have committed sins, you will be forgiven, which is good and necessary. But grace does more than sanctify. It also enlightens the mind, strengthens the will against sin and temptation, helps us to be faithful to God and rids us of attachments to sin. Grace helps us to grow in holiness. All of this is certainly something that every person could stand to have more of. The Catholic faith is not about doing what you need to do every day in order to stay out of hell. It's about growth and maturity and persevering to the end (as Paul encouraged us to do) and strengthening our relationship with Christ. 30:06 - The Mass is not a continual reminder that one's sins are not fully paid for. No Catholic believes that, and that is not what the Church teaches. You quoted Hebrews where it says that Jesus paid it once and ... FOR EVER. Did you miss that part? Jesus "continues a priest for ever" (Heb 7:2) and "He always lives to make intercession for us" (Heb 7:25). The Mass simply makes that perpetual offering present to us. 31:46 - We are not "paying for sins again, and again, and again", as I have already explained. 32:01 - The primary purpose of going to Mass is not "to get freshly cleansed." It is to offer to God the worship He deserves. It is only secondarily about what we might get from it. 32:40 - Confirmation does not signify that the young Catholic has now "come of age." That is a widespread misconception, not the teaching of the Church. 35:00 - There was no "upgrade". The teaching of the Church has always been the same regarding salvation in the Church. What Vatican II did was to clarify what it means to be "outside of the Church." You can find similar statements throughout the history of the Church. 37:52 - Catholic ecumenism does not "ignore differences" and that is not what Pope Francis is doing. Ecumenism is about using what we have in common as a bridge with which to bring Catholics and Protestants together so that we can experience unity in what we have in common, and so that the charity engendered by that unity will permeate our discussions of the things that we differ on and help us to come to a greater mutual understanding. This is the desire of not only Pope Francis, but of his recent predecessors as well. 41:23 - I have never seen Eph 5:26 used to defend Purgatory. I'm sure someone probably used it before, but it's not the go-to passage I would use. In fact, I'm not sure I would use it at all, since it only really applies to Purgatory in an analogous sort of way. I think you're tearing down a strawman here by using that passage as the representative text in defense of Purgatory. 53:36 - There is no belief entrenched in the heart of Catholics that Mary loves us more than Jesus. I'm sorry, there's just not. I've also never heard of the prayer that you recited. I'm sure you can find it somewhere on the internet, but it's not a part of the common prayers that Catholics pray every day (the Our Father, the Hail Mary, the Glory Be, the Prayer to St. Michael the Archangel, etc.). I could explain the meaning of the prayer, but this is not the place for that. 54:58 - We don't pray to images. Instead, we pray to the saint who is depicted in the image. 55:38 - We are also not taking something identical to worship and giving it a new name. Whether or not something is worship depends on the intention of the person performing the action more than it does on the action itself, and no Catholic intends to grant to the saints the adoration that is reserved to God alone. We know all the passages against idolatry. We do not worship anyone or anything other than God. 59:02 - The Catholic rebuttal is not that the word "brother" means "cousin", or at least that's not all that we say the word means. We acknowledge, as every Greek dictionary will tell you, that the word for "brother" (adelphos) encompasses a host of relations: sibling, cousin, nephew, close friend, tribesman, someone of the same nation, someone you share a spiritual kinship with, etc. 1:00:58 - We don't emphasize Mary more than Jesus. In fact, central to each of the Marian dogmas is a truth about Jesus that we are simultaneously affirming. Mary can't help but point to Jesus, and our Marian doctrines can't help but affirm Him. Our Marian doctrines redound to the glory of Christ. I think that's everything. Notice how I couldn't go more than 2 minutes or so without stumbling over something that was not presented accurately. It's shocking but I'm afraid that is the reality with many Protestant apologists. They simply do not know what they are attempting to refute. I don't think that Mike is intentionally trying to deceive anyone. I just think that there is still more that he could stand to learn about the Catholic faith. To your average American, the 26 Martyrs of Nagasaki are probably not very well known. But, their story deserves to be told, especially on this their feast day.